This is a delicious dinner for a cold winter’s day. Not that I get the chance much here in Sydney, but once in a while it get’s cold enough to pretend it’s actually like the UK. Tonight was such a day so this delicious pork went down well. 250g mixed gourmet style mushrooms (chanterelle, fresh porcini etc) If you can’t find them then use more button mushrooms. Wipe the mushrooms with a dry paper towel then slice roughly. 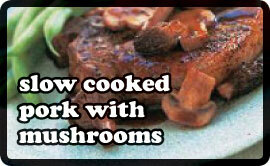 Heat a large frying pan with 3 tablespoons of oil over a medium heat and add the mushrooms. Cook for about 10 minutes until soft. Cover and set aside. In a large lidded casserole pan, heat the remaining 3 tablespoons of oil over a high heat and add the pork ribs in batches and cook until lightly browned on all sides. Reduce the heat and in the same pan, fry for about 30 seconds the garlic and rosemary. Add the dried porcini and their juice together with the sherry, 200ml of water and then the ribs. Reduce the heat to low and cook for 1 1/2 – 2 hours until the ribs are tender. Stir occasionally and ad more water if neccessary. Stir in the mushrooms, and cook for a further 10 minutes with the lid off. Check for seasoning and serve.